"The Rum Diary" has landed two more great cast members for it's Puerto Rican booze-filled story. Both Richard Jenkins and Aaron Eckhart have signed on to the adaptation of the Hunter S. Thompson novel of the same name. Johnny Depp is back portraying another one of the self-based characters created by Thompson, Paul Kemp. Amber Heard was announced last week as Chenault, the love interest of Kemp who becomes involved in a love triangle, amoung other things, while marooned in Puerto Rico. Richard Jenkins is officially signed on to play Lotterman, the struggling editor and chief of the San Juan rundown newspaper The Daily News, where Paul Kemp (Depp) works as a journalist. Jenkins who was nominated for his somberly gripping performance in "The Visitor" who be a wonderful edition to the Thompson novel being produced by Depp, Christi Dembrowski and Graham King. 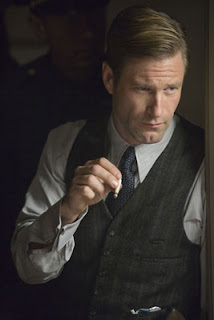 Aaron Eckhart's casting is somewhat puzzling. While he is not officially signed on just yet (he is in final negotiations), his casting news is either incorrect or Bruce Robinson who adapted the novel for screen took some huge personal liberties with the script. THR reports that Eckhart has been cast as Sanderson, "a wealthy landowner who believes everything has a price and introduces Kemp to a different standard of living." THR further reports that Sanderson (Eckhart) is involved in the love triangle with Kemp (Depp) and Chenault (Heard). In the book, Chenault, Kemp and Yeamon, a fellow journalist who is anything but wealthy are involved in the love triangle. Sanderson is definately within the novel, but he has nothing to do with Chenault's and Kemp's romance. So what gives? Is THR misinformed on exactly who Eckhart is playing or what his character entails? Has screenwriter and director Bruce Robinson altered the tale? Personally I hope Eckhart is infact playing Sanderson, but he is not invloved in the love triangle and Yeamon is kept intact. Yeamon is a violent and colorful character and should not be excluded. "The Rum Diary" will begin shooting in Puerto Rico March 30th and hopefully will be hitting cinemas late this year or early 2010.